I'm such a tea-aholic and not even the tiniest bit ashamed to admit it! I love the variety, the tastes, how deliciously it goes with a piece of toast or a biscuit and skipping my morning cup of tea just isn't an option. I drink tea all year round, of course, but during the Winter months I find myself drinking a lot more of the good stuff mainly to warm me up but also because I have a slight obsession with festive flavours! Anything spicy, sweet or zesty is going to get the thumbs up from me during this time of year and dare I say it but I think I've found THE best festive teas on the market. Bluebird Tea Co. is a unique tea mixology company on a mission to make people happy with tea, and they've 100% succeeded with me! 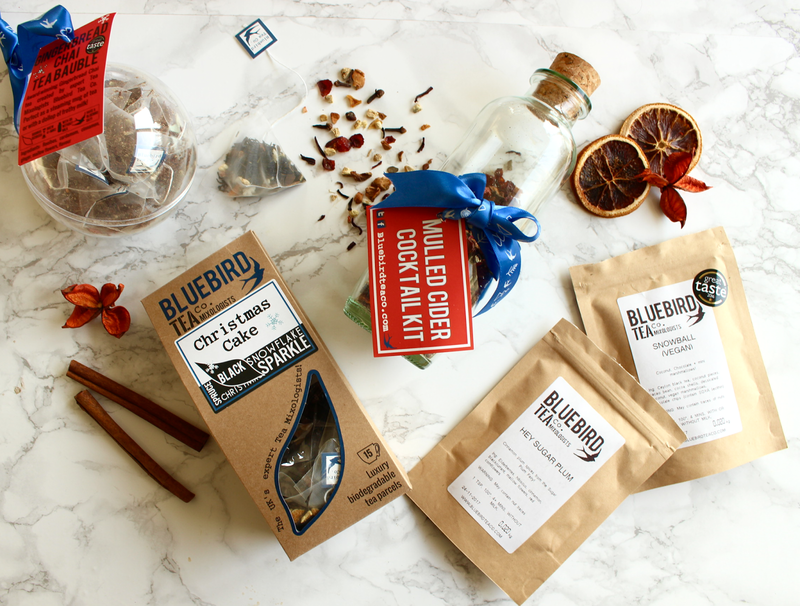 Bluebird Tea have the most incredible range of tea flavours and their Christmas range is one of dreams, featuring Gingerbread Chai and Christmas Cake flavours along with the some great tea inspired gifts that would be ideal for tea lovers! Let's start with the Christmas Cake flavour tea, as that was the one I was most excited to try! Cake tea? Yep, it's as good as it sounds. This is a blend of ceylon black tea with vanilla and almond pieces along with cinnamon, cloves, orange peel and spruce needles - it's the most comforting and festive cup of tea I've ever had the joy of drinking. Christmas Cake tea is perfect on it's own but even more delicious with a splash of oat milk! Now for the two products I think would make amazing presents for tea-aholics like me! 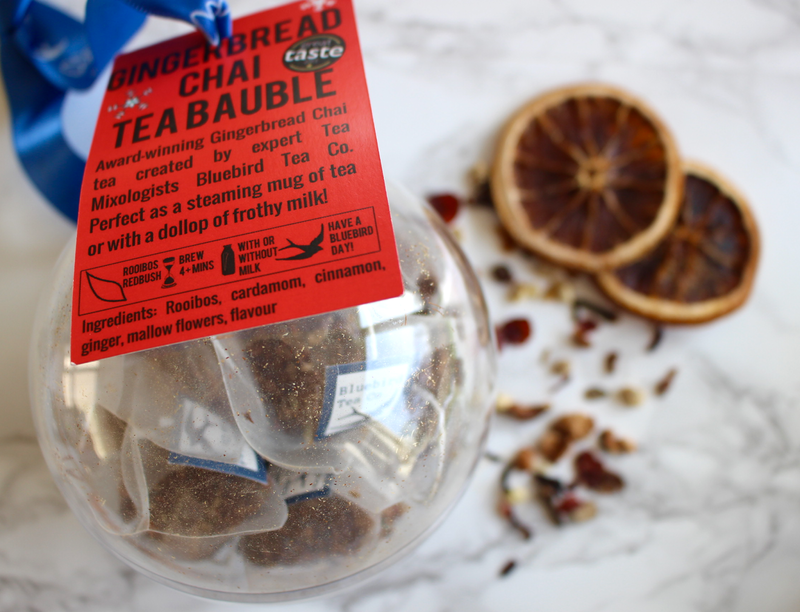 First we have the Gingerbread Tea Bauble which is such a cute idea; 10 Gingerbread Chai tea bags inside a clear bauble that you can hang on the tree! Next up is the the Mulled Cider Cocktail making kit which I can't even tell you how excited I am to try. 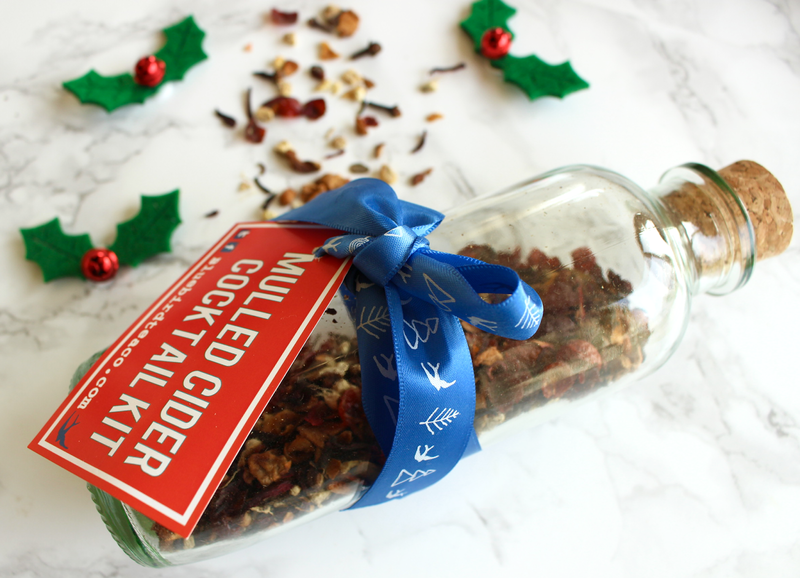 You fill the glass bottle with a cider of your choice and let the spices work their magic for 48 hours then gently heat it up on the stove for the most Christmassy tipple - perfect to enjoy with your other half or best friend! The two packets of loose leaf tea are both irresistible. My favourite of the two is Snowball which is a combination of ceylon black tea mixed with coconut pieces, cacao bean, vegan mini marshmallows and vegan chocolate chips - heaven! This tea with a splash of plant-based milk is like a Christmas hug in a mug. 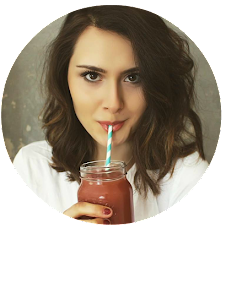 Then we have Hey, Sugar Plum which I am actually sipping on as I write this blog post and it's truly yummy! This loose-leaf tea is a mixture of spicy cinnamon with elderflowers, hibiscus, blackcurrant and mallow flowers. I love the taste of the berries combined with spice for that added warmness that's much needed on these cold days. 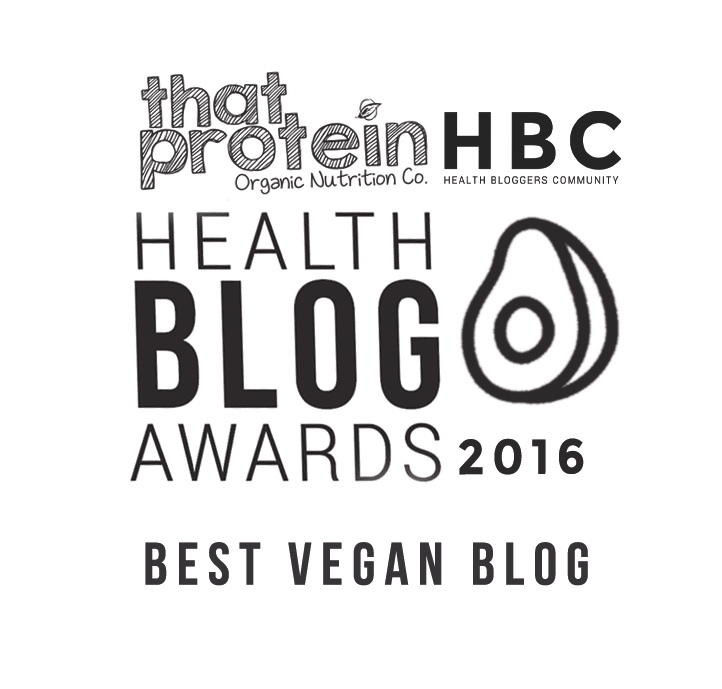 This blog post is not sponsored....and I can honestly say these are the best teas I've ever had! 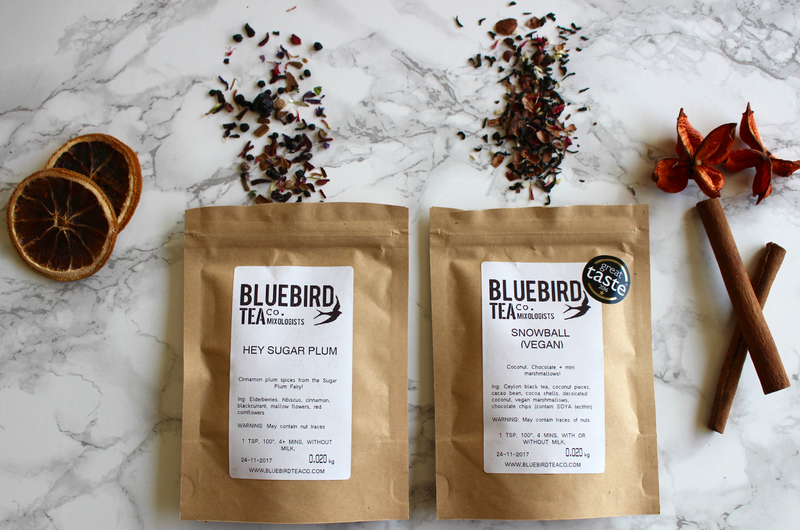 Bluebird Tea Co. have a wide range of tea flavours, as well as beautiful gift ideas for Christmas so do go and take a look at their website and make an order, your taste buds will be very happy for it.